1.Programming for Benz smart key via infrared or on board programming,even the car lost all the key. 2.Read/Write for BENZ ESL(election steering lock)via K-Line,no need take out ESL from the car. 3. for Unlock BENZ ESL(election steering lock)via K-Ling with out key. 4. for Read/Write BENZ ESL(key IG module)/BMW CAS/CAS2/CAS3 via ICP(no need take out MCU). 5.Renew smart key function,renew used benz samrt key. Q: What is the difference about AK400 and AK500? 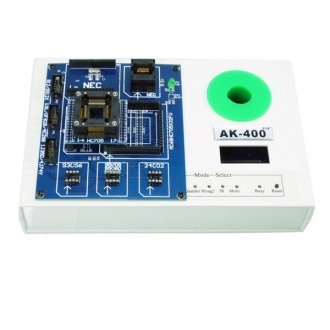 A: AK400 can do both BMW and Benz.AK500 more mainly do BENZ Cars.AK500 function more powerful,the most import is it has the good function for Motorola chip programming and with a 40G hard disk.